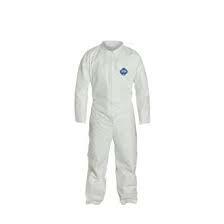 The Little Giant Beekeeping Tyvek Coverall with a full-front zipper closure will keep you protected while caring for your bees. Elastic closures at both the sleeves and ankles will keep out bees. This easy-to-wear suit is water-resistant and disposable. You're sure to find many uses around your home and farm for this coverall! Available in three sizes: Medium, Large, and Extra Large.